BEAUDENS Robot Vacuum Cleaner is a versatile and efficient little cleaning helper that keeps dog or cat hair, breadcrumb, oatmeal and even dog food in check with minimal efforts that works excellent on hard surfaces and carpeted floors. It has a 800Pa suction power and 3 optional cleaning modes that relatively clean your floor with its smart path navigation. If you have pets at home, keeping clean environment might be bothersome. BEAUDENS Robot Vacuum Cleaner can help! Its Low-profile, tangle-free and ultra-slim 2.9” design can reach those hard-to-reach places, under the couch or bed, where unwanted fibres and hair lingers. 3.his robot is mechanical anti-collision is not infrared anti-collision. 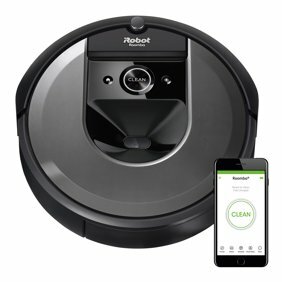 4.Like all other similar cheap robots in the market, it's just a basic robot, has no map planning function, his indoor cleaning coverage or area is greatly affected by the environment, have a certain randomness. LOW PROFILE:2.99”/76mm thin low profile, can travel anywhere. Detachable dustbin make clean more convenient. Never suffer the awkwardness of dragging around those bulky vacuums, just keep your home clean without lifting a finger. This robot sweeping machine features a 2.99’’/76mm ultra-slim profile and is small enough to fit under the couch bed or any type of furniture, so it can travel through any room. No brush design and powerful 800pa suction does not clog with dog or cat hair. Its two side brushes extend the reach range and rotate to catch dirt and debris in corners. The built-in HEPA filtration captures extra fine dust, dirt, pet hair, food debris, lock in small particles without leakage, expels non-allergenic fresh air. This floor robot vacuum can automatically work on any kind of flat floors like hard floor, tile, stone and thin carpet, easy one button power up. Does a great job cleaning up the dust and small items . The dust and dog dandruff that otherwise would be left on the floor till the day of vacuuming. We use it twice a week on the first floor and the rest of the time upstairs. Love it. It became a member of our family. Rudy even took my 5 lb York or for a ride. The dog was impressed as much as we were . Had the robovac 10 which was the predecessor to this made by Diggro. Died one year to the day. Loved it when it was working but only used it about 20 times and dead. Had to edit my review. Diggro made it right by sending me a replacement and their customer support was excellent. They stand by their product and even upgraded me to a newer version.